Campsite reservations are available online or by calling our camping experts at the Arizona State Parks Reservation Desk 1-877-MY PARKS. We're available seven days a week from 7 a.m. to 7 p.m. Arizona time. There is a $5 non-refundable reservation fee per campsite. The office at Lost Dutchman is open until 7 p.m. for campsite check-in, but after hours (with campsite reservations) you can grab a map by the ranger station and head straight to your campsite! If you are staying multiple nights, check in with the camp host or a ranger to get a vehicle tag. The campground has 138 sites: 68 sites with electric (50/30/20 amp service) and water and the remainder non-hookup sites on paved roads for tents or RVs. Every site has a picnic table, and a fire pit with adjustable grill gate. 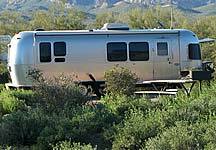 There are no size restrictions on RVs. Well-mannered pets on leashes are welcome, but please pick after your pets. There is a $15.00 per night fee for second vehicles. The fee will be paid upon arrival at the park. The fee does not apply to vehicles towed behind a primary vehicle when the primary vehicle remains at the site and the towed vehicle is used for transportation. Arizona cabin rental options are availabe throughout the state...Adventure is just a short drive away.